List of Contributors. Preface. Introduction. 1. Cereal grain structure and the way in which fungi colonize kernel cells (H.L. Schmidt). 2. Mycology of cereal grain and cereal products (M.O. Moss). 3. Fungal pathogens influencing cereal seed quality at harvest (J. Chelkowski). 4. Alternaria and their metabolites in cereal grain (J. Chelkowski and J. Grabarkiewicz-Szczesna). 5. Fungi in cereal grains: their occurrence and water and temperature relationships (J. Lacey and N. Magan). 6. Development of molds, mycotoxins and odors in moist cereals during storage (D. Abramson). 7. Mycoflora and mycotoxins in stored rice grain (M. Manabe and O. Tsuruta). 8. Evaluation of cereal grain quality using mycological methods (K. Trojanowska). 9. Mycological quality of mixed feeds and ingredients (J. Chelkowski). 10. The usage of volatile compounds produced by moulds as indicators of grain deterioration (E. Kaminski and E. Wasowicz). 11. Changes of chemical grain components, especially lipids, during their deterioration by fungi (E. Wasowicz). 12. Influence of agricultural biocides on mycotoxin formation in cereals (M.O. Moss). 13. Occurrence of ochratoxin A in swine blood as an indicator of mold activity in cereal grain (K. Hult). 14. Applications of bioassays for screening of Apergillus and Penicillium mycotoxins (V. Betina). 15. Secondary metabolites mycotoxins produced by fungi colonizing cereal grain in storage - structure and properties (P. Golinski). 16. Current taxonomic concepts in Penicillium and Aspergillus (R.A. Samson and J.C. Frisvad). 17. Mycotoxins produced by species of Penicillium and Aspergillus occurring in cereals (J.C. Frisvad and R.A. Samson). 18. Economic methods of grain drying to prevent spoilage and loss of quality (D.M. Bruce and A. Ryniecki). 19. Possibilities of reduction or elimination of mycotoxins present in cereal grains (P.M. Scott). 20. Mycotoxins and fungi of fermented foods made from cereals (C.W. Hesseltine). Glossary. Subject Index. Index of Fungi. Fungi growth in the storage of cereal grain has led to serious losses of grain quality and quantity each year the world over. These fungi and moulds are capable of producing mycotoxins which accumulate in grains. 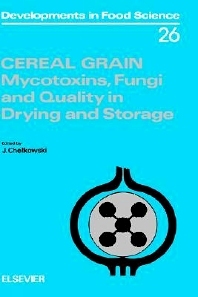 This book contains reviews from 21 experts on the relationship between mould growth in grain and its effects as well as the accumulation of mycotoxins. Discussed are properties of "storage fungi" such as the water and temperature relationship, taxonomy and nomenclature aspects etc. New methods of storage allow for early detection of these mould growths. Significant attention is paid to Aspergillus and Penicillium species colonizing in cereal grain and their growth requirements. The book touches on the significance of mycotoxins in grain being used for food production and possible detoxification processes. There is considerable attention given to a new technique of decontamination in countries with humid climates involving proper drying techniques at low temperatures or heated air dryers. This volume covers numerous scientific and practical aspects of grain storage on farms and in industries which are important in preventing quality losses and contamination with mycotoxins.